Diego Costa: Is Chelsea striker just a fast starter or the real deal? Diego Costa could add a further historic flourish to a spectacular start to his Chelsea career in Sunday's clash with champions Manchester City. The Spain striker has scored more goals - seven - in his first four Premier League games than anyone before him. Another goal for the Spain striker at Etihad Stadium could see him equal the record of eight - jointly held by City's Sergio Aguero and former Coventry forward Mick Quinn - for a player's first five outings in England's top flight. Diego Costa Chelsea (2014-15) 7 ? On the evidence we have seen so far, and despite a nagging hamstring problem restricting him to a substitute's role in Wednesday's Champions League draw with Schalke, few would back against him getting more than one. Considering his sensational form since his £32m move from La Liga champions Atletico Madrid this summer, the easy assumption is that Costa is a natural-born goalscorer who has always been a prolific marksman. That is far from the case, however. Until just over 12 months ago, he had a very different profile and looked more likely to spend his career as a useful but problematic squad player rather than "one of the greatest strikers in the world", as Jose Mourinho recently called him. Although Costa has always been a tremendously hard-working, committed and team-oriented player, for a long time goal-scoring was by no means his greatest strength - in fact, it was arguably his greatest weakness. After leaving his native Brazil as a 17-year-old in 2006 to sign for Portuguese side Braga and then joining Atletico a few months later, he was sent on loan to no less than five different clubs and failed to set the world on fire. During his first six seasons in Spain, two of which were spent in the Segunda Division with Celta Vigo and Albacete, Costa's league-scoring tallies were less than impressive: 6-10-8-6-10-10. With his loan spells doing little to suggest he would ever become a regular starter for Atletico, Costa came extremely close to leaving the club for good in the summer of 2011, a move to Turkish side Besiktas only falling through when he suffered an injury after the deal had been agreed. In those early days Costa always had potential, and his sheer determination was greatly appreciated by his various managers, but he was also extremely raw and inconsistent - especially in front of goal. But there is a simple explanation for the striker's late development: until the age of 16, he had essentially been a street player, receiving little in the way of formal coaching and playing virtually no organised football. Whereas most young players develop their technique under the guidance of qualified coaches and the benefit of professional facilities, Costa learned the hard way on the streets of Lagarto, his small hometown in Brazil. Rather than scoring feats, the statistics that caught the eye in Costa's early years were his disciplinary problems. The fiery forward received 49 yellow cards across five league campaigns between 2008 and 2013. His street-fighting mentality and fierce ambition to establish himself as a successful professional was a double-edged sword. On the one hand, it made him an incredibly hard-working and brave player with little consideration for his own personal safety. On the other, it made him a magnet for trouble, his unquenchable competitive spirit too often crossing the line into outright nastiness. At times, he appeared to be so busy looking for a fight he would forget to play football. The most unpleasant manifestation came in February 2013, when he embarked upon a running battle in a match against Sevilla which concluded with opposing midfielder Geoffrey Kondogbia receiving a red card for a stamp on Costa and later accusing the Atletico striker of racism. A few weeks earlier, Costa had enraged Real Betis defender Antonio Amaya by aggressively mocking him for a mistake which led to an Atletico goal, leading Amaya to spit on him in a subsequent encounter and thunder: "Costa has no heart and no shame." At that time, the Brazil-born striker was firmly established as public enemy number one for opposition fans and even his greatest admirers would have been forced to condemn some of his on-pitch antics. His temperament was getting in the way of his talent. The major turning point in Costa's career came in the summer of 2013 when Atletico accepted an offer from Monaco for Radamel Falcao, their leading scorer and attacking focal point. Suddenly, Costa's role was transformed. Rather than serving as a physical foil for the Colombian's predatory talents, he was now the most important striker at the club, around whom the team's style would be constructed. The additional responsibility presented a huge challenge, but it also brought a welcome display of confidence and immediately proved to be the making of a significantly improved player. Another key factor was the huge influence of Atletico boss Diego Simeone, a fellow South American who knows a thing or two about successfully harnessing an aggressively competitive nature. He recognised a kindred spirit in Costa. Simeone could regularly be seen yelling at Costa from the sidelines during games, beseeching him to calm down and avoid trouble. Motivating Costa has never been a problem, but Simeone managed to channel his energies in a more constructive manner. He also played Costa cleverly with his media declarations, simultaneously reinforcing his confidence by regularly telling the world how good he was, while also keeping his striker focused by issuing public reminders that he still had a lot of room for improvement. The combination of Costa's new importance within the team, his greater experience after a late start in the game and his relationship with the father-like Simeone turned him into a far more mature performer, thriving on his new status as Atletico's chief goal-getter. Costa's rapid improvement saw him score 27 league goals, and 35 in all competitions, to spearhead Atletico's unlikely title triumph last season, and also moved Spain national boss Vicente Del Bosque to persuade him to switch international allegiances from his native Brazil. After a long and fraught journey, Costa had finally arrived. Lingering doubts - a question of style? Despite his success over the past 13 months, can a player who never registered more than 10 league goals in a season until he was 25 really transform himself into a goal-per-game scorer? History suggests that kind of dramatic improvement is rarely sustained in the long term, but one man who bucked the trend is former England captain Alan Shearer. The Newcastle legend (206 goals in 404 games) was not a particularly consistent marksman during his early days with Southampton (23 in 118 league games) but became a goal machine after moving to Blackburn (131 goals in 172 games). 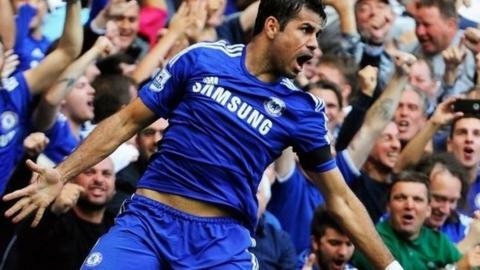 Shearer has been impressed by Costa's exploits in England so far, telling Match of the Day: "He is looking the real deal. When it is not going as it should be for Chelsea, they have a goalscorer who can get them out of it. "He is always available. He always wants the ball to feet and if you want to push him around and bully him, it is all right because he will do the same to you." While Costa will never shy away from a physical challenge - one of the main reasons he has adapted so quickly to English football - what will happen when English football adapts to him? Will Costa continue to be so successful when Premier League managers have worked out how to negate his strengths? Costa's struggles on the international stage (he has not scored in seven appearances: two for Brazil and five for Spain) have done nothing to allay suspicions that he is a limited performer who can only thrive in a predominantly counter-attacking team. Spain, of course, play in a very different manner, and after Valencia striker Paco Alcacer's goalscoring debut against Macedonia earlier this month, Del Bosque now has to decide whether to stick with Costa or switch to a player, like Alcacer, whose abilities are more in tune with his team's short-passing, possession-based approach. In Spain, many fans are currently siding with the latter option. In contrast with his difficulties in establishing himself in the international arena, Costa is perfectly suited to the demands of English football. With fans expecting their teams to opt for all-out attack rather than worrying about the space they leave behind, it's unlikely he will come up against too many of the deep-lying, disciplined defences that cause him trouble. Will Costa's celebration remain a familiar sight in the Premier League? Instead, the physical and fast-paced style of the Premier League should continue to play to Costa's strengths, finding space in which to operate and bullying opposition defenders out of his way as he charges towards goal. Chelsea, it is clear, have got themselves an uncompromising striker who will give every ounce of effort for the cause, and who has significantly improved both technically and mentally after struggling during the early part of his career. Whether he maintains his prolific scoring rate remains to be seen, but the early signs are encouraging.